My last class marked the halfway point on this module. Four down and four to go, but I can’t say it looks like it’s half done. But I have to use around 5 different stitch patterns within this design, some more open than others. So even though a 4 on my scale may mean using 3 strands of Anchor cotton, that is going to look different in each of my stitches and 3 strands of cotton on the figures’ legs may look much darker from a distance than the same thread on the wall behind her. To compensate for this I need to adapt the stitch pattern to either add or remove some stitches and adjust the density of the stitch. Or, if I want to keep the stitch the same for design purposes, I’ll need to deviate from the key and use a different thread to achieve the right shade. The whole thing is a balancing act, constantly juggling stitch with thread and comparing the developing work with the original image. I’m paranoid about making the background too dark or too light, throwing in the blackest black where it should be a mid tone and leaving myself with no darker tone for the shoes or the gloves. Take the area that I’ve worked on today for example: the upper left side of the background where the light moves from bright to very dark in the shadow of the models’ arm. The changes in tone are so varied! and in trying to incorporate every little undulation in shade I’m not only losing shape, but losing the relationship between the arm shadow and the top right corner of the image. Is this a problem? I haven’t got a clue. But, as important as it is to follow the photograph, I also want to have the freedom to decide what’s best for the embroidery as a stand-alone piece. After all, once it’s done no-one will view the two together, and the embroidery has to work as a realistic and well composed image. It’s inevitably going to be stylised to a certain extent – it’s a textile piece and not a photograph – but it has to make sense and if the lighting in the image is illogical then the brain of the viewer will be quick to flag it up. And to add to the difficulties, winters limited daylight hours are putting the pressure on! I set up shop in front of our big bedroom windows and door to work a few afternoon hours this weekend, but before long the natural light goes and my harsh lightbulbs don’t cut the mustard. Beautiful! 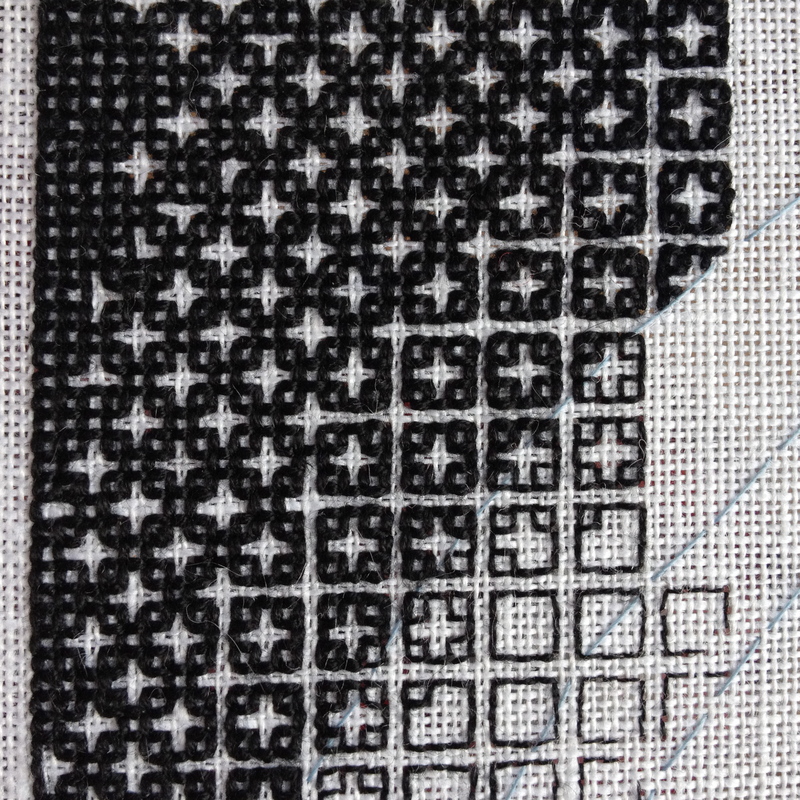 I’m so excited to find a blog about black work embroidery! I recently fell in love with the look and have been wanting to learn more about its different applications. This is amazing and I can’t wait to see the finished piece! Wonderful blog Sarah. A great resource for embroiderers. 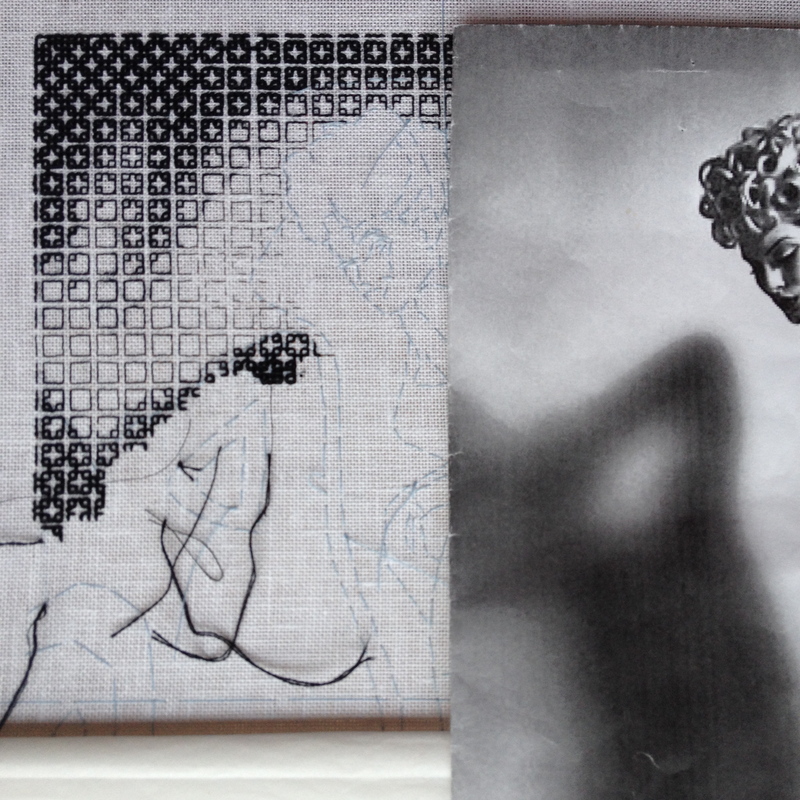 Loved your choice of subject matter for your RSN Blackwork piece. Everything about this work is stupendous. Brings back memories of when I did the RSN Certificated Course in 2000-2001.